Hi, I’m revamping my old match-3 game Easter Bonus to release it on a bunch of platforms in April (XBLIG, Flash, iPhone/iPad, PC/Mac/Linux, Android). I already have a developer for the XBLIG version and I’m handling the PC/Mac/Linux versions. I’m looking for developers who ALREADY HAVE A MATCH-3 ENGINE on Flash, or iOS, or Android. I will supply the graphics, sound and music and will design and produce the game, and you will convert your existing engine to run my game design. I’ll publish the game and will include your logo as a splash screen and you’ll be in the credits of course. We’ll split the revenue 50/50. I need to get started on this right away and the project will last about 4-6 weeks. If you are interested please email me with details about your previously published games and the working match-3 engine that you have. Thanks! 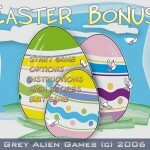 This entry was posted on Saturday, February 5th, 2011 at 2:53 am and is filed under Grey Alien Games. You can follow any responses to this entry through the RSS 2.0 feed. Both comments and pings are currently closed. Hi there, someone else ported HB to XBLIG. Then they did Spring Bonus on WP7. In theory we could do an XBLIG version too, but we have plans to make another WP7 game first. I’m really at the mercy of when he can work on it.